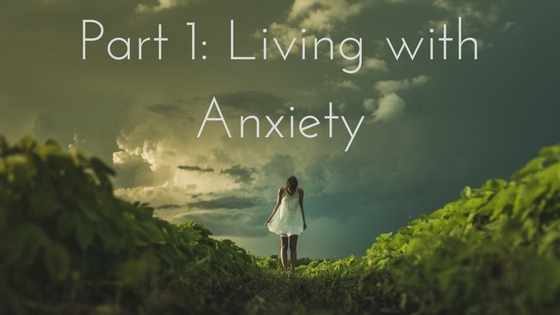 Is it weird that I’m anxious about writing about anxiety? I don’t know why, maybe we can figure that out together. I’m not sure when I had my first panic attack, I remember having one when I was 21. I was sinking in life and not making good decisions. They weren’t bad either, they just were not decisions that moved my life forward. Panic attacks happened, but regular anxiety? That was later. It wasn’t overnight that the fidgety restlessness would set it, it was a long honeymoon between being fine and camping out in my apartment for days at a time. Oddly, the confines of my home always make me feel better. The crippling anxiety came at about 23 and was a regular occurrence by age 29. I had this sofa with high square arms…I used to drape myself over the arms of the sofa with the majority of the compression on my abdomen and cry or breathe into the cushions. If I could get the panic to subside, I would do something I had control over, like make a dish of food or clean. But the thing I would do the most is avoid. Avoid any of the things that I needed to do in order to cope was the perfect solution in my head. I would hide in my bed from the boogeyman that lived inside of me and pray that I was safe there (I wasn’t). I would create other things for myself to do as opposed to doing what was scary. Or what I interpreted as scary. I’m positive every single thing I’ve been scared of, wasn’t that big of a deal in the end. But what was I doing inside of my mind that gave this feeling such power? Why did it take me forcing myself to face the fear to get it to happen? What is this insane game I’m playing with myself??? I think I’m still grappling with many of those answers. Sometimes what is breaking me down is clear, but it’s the middle of the night and I’m trying SO hard to go back to sleep so I can tackle it in the morning. Sometimes, it takes me awhile to try and assign a cause and other times, I have no idea. Usually when I have no clue as to the cause, is when the avoidant behavior happens. But over time, I have been creating solutions and tricks to manage different triggers for my anxiety. So I’m going to share them with you and maybe one can help. On Sunday evenings I often to begin to feel the pull of the week. My mind shifts into the next day as I mentally prepare for everything I need to get done. Something that has helped is when I’m relaxed and trying to enjoy my evening at home, I have a hard time focusing. By having a pad of paper and a pen by my chair, I can jot down my To Do List with every little thing that pops to mind. When I know its written down all in the same place, my mind relaxes and I can enjoy being in the moment with my family. I often remember something in a relaxed state, that I might overlook in the rush of the week. This is a challenging one to try. Have you ever looked at the percentage of time you send on certain applications? You can look it up. It wont make you feel better about yourself. People spend an average of 2 hours a day on social media. We have quickly adapted to grabbing that phone at any lull in the conversation, we don’t even know how much we’re doing it. So try this: pick 4-6 hours to begin to NOT be on the phone. Put the phone in a drawer, shut the ringer off or even just turn off the push notifications and step away from the phone. What are you doing on there anyway? How many times do you need to read the same meme shared over and over? You don’t. 4. If you wake up early, get out of bed. This might be the hardest one of all, because if you wake of at 2am, you can probably get back to sleep. So lets create a parameter: if you wake up within 2 hours of your final alarm (not the first one). Get out of bed. Especially, if you know you’re going to grab the phone and scroll for an hour anyway. Why? Because something has made you wake up and maybe you didn’t need that much sleep anyway. Get out of bed, tackle some of those emails over a cup of coffee or tea, try the relaxed approach to the morning by savoring your time for a change. This doesn’t have to be every day, but lets say you wake up and have a really productive day. How are you going to sleep the following night? Probably pretty awesome. Move through your day so you deserve that really awesome sleep later. We don’t wear ourselves out enough. We want the kids and the dogs to be worn out, but why not us? When did we get the pass? We didn’t and our bodies and minds are rebelling in your bed. You might feel tired after a long day of work and look forward to crashing on the couch. New York Times reported that 80% of jobs are sedentary or require low activity. The only muscle you’ve been working is your brain and while, yes, the brain gets tired, there are 649 other muscles in the human body that could use some activity. Now that the weather is turning nicer, its easier to take a walk or find an activity outside that encourages movement. Part 2 will be posted in 2 weeks.